Social media is a friend and a foe, all rolled up into one. It can help you feel connected and allow you keep up to date with the goings on in your circles. But conversely it can create a distance in real human connection. Sometimes it can seem easier to just Facebook someone or send a text. But real human connection is vital for the human soul. Friendships cannot be just played out in a virtual world. I know when you're feeling down it can seem almost impossible to pick up the phone and invite someone to meet face-to-face. But it's something I really recommend. Invite someone for a cup of tea and a chat, it can help lift your spirits. The downside to social media sites is that it can lead us to compare our lives to other people's highlight reels. Everybody wants to share their best bits. They don't share photos of themselves in their jammies covered in toast crumbs at 2 pm on a Saturday. Remember that. You don't see the full picture! With the recent tragic loss of Robin Williams we felt the need to post this. It shows just how troubled the mind can be even when everything seems perfect on the outside. He is a great loss to the entertainment world and hopefully he will be remembered for his life rather than his death. 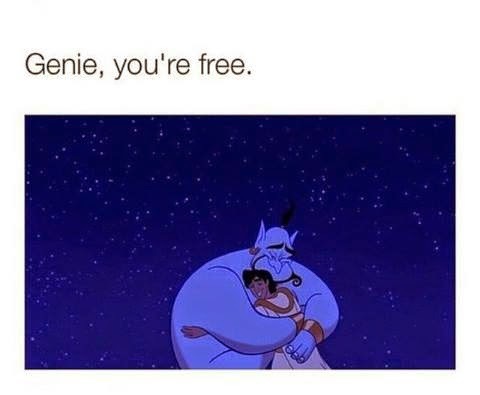 No Genie, You’re not Free. Now, the truth in this is debatable. Some people talk a lot and say very little. I have always been a talker. As I’ve got older, I’ve begun to listen more and more. Sometimes what I hear uplifts me. Sometimes it frustrates me. Sometimes it spurs me to action and other times it comforts me. The written word can be just as, if not more, effective. Sometimes what I read on this blog encourages me to think in a different way about life. I can agree with that which I read; I can disagree; I can identify with what is shared by others or not. There is no ‘wrong’ here. There is simply solidarity. 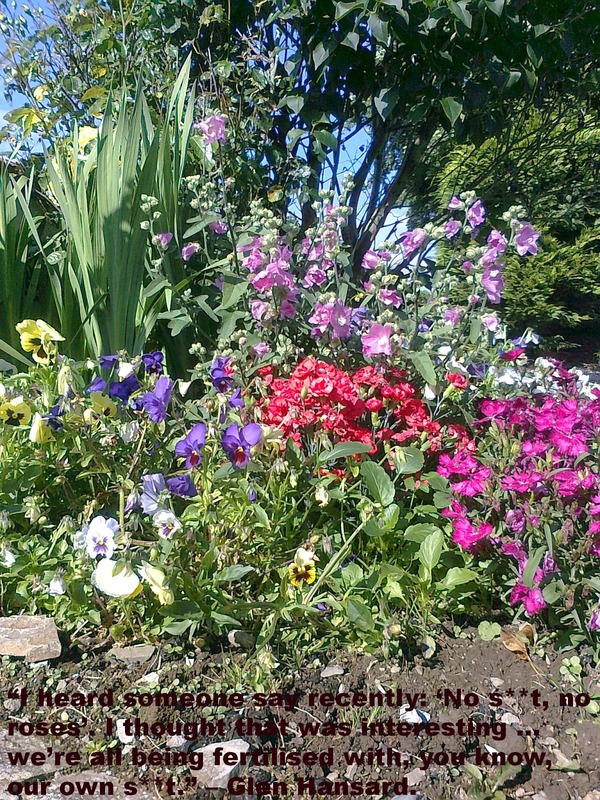 I took this photograph in my mother's garden and I heard Mr. Hansard's wise words in a clip of him speaking to the audience during a performance, which was posted on-line. My point is: We do not have to look far for inspiration. There is comfort to be found if we look for it. There is meaning in the s**t...it is how we choose to use it that matters. Trust. You will have roses. Sometimes when we are in the middle of a challenging situation it seems like the easiest thing to do would be to just give up... BUT! The toughest times always bring the best rewards! When you are getting close to your goal obstacles may get in your way but remember 'Fall down 8 times get up 9'!